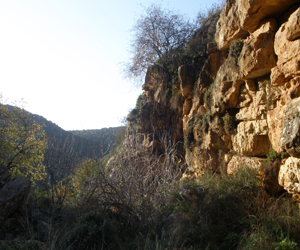 Nahal (river) Amud (pillar), the valley below Tzfat, is one of Israel's best-known nature trails. The name of the valley comes from a spot along the trail where a large stone pillar springs up in the midst of the riverbed, an area which has been eroded by flooding and other natural changes over the last 20,000 years. But the valley itself extends over a large area, from Tzfat in the northeast to the Kinneret in the south, and past the Meron mountain range in the west. The nahal runs north to south, and hikers come especially to the area to enjoy the trail, one of Israel's most well-traveled. There are many spots where one can pick up the trail, but a popular option is to start in Tzfat and head downhill, through the wadi (valley) and pick up the trail below the town. Nahal Amud plays an important part in the development of Israel's North, particularly during the Middle Ages, when Jews were searching for new homes after having been expelled from Spain and Portugal. Many of these Jews made their way to Israel after having lived for a time in Greece. These people brought with them the then-new technology of fabric-making, which involved tightening the woven wool to make the strings taut, allowing a high quality cloth to be produced. Up until that time, the process involved beating the wool with a club or trampling it. In the 15th century, the new arrivals from Greece were able to introduce the technique which harnesses water to make the mills (fulling mills) to full the wool. When these mills were built in the wadi, the cloth industry in the area, particularly in Tzfat, began to thrive, making Tzfat and other areas surrounding Wadi Amud an economically feasible area for new settlement and development. By the 19th century, most of the mills had been converted to flour mills, and these buildings dot the trail as people descend into the wadi along the trail. Trail-walkers generally tend to descend into the wadi from Tzfat, walking down through the ancient cemetery of Tzfat, crossing the new highway, and starting the trail near the gravesite of Rabbi Pinchas Ben Yair, a well-known Talmudic Rabbi. The Sichvi pools are the first body of water that hikers encounter as they walk down the trail, which is marked by paintings on rocks along the path with blue and white notations. After that are the springs of Ein Koves and shortly thereafter, the waterfall of Ein Seter. One of the highlights of the walk for many hikers is the variety of flowers and fauna along the trail. Connate Alexanders, meter-high flowers which are highly sought-after for ornamental purposes, spring up between rocks. Mandrakes, purple orchids, and "zumzum" flowers are plentiful, along with frogs, turtles, vultures, hawks, and many species of butterflies. There are caves on the sides of the trail, and hikers often come across local herds of cows and goats, along with their goatherders and cowherders, who provide animated conversation and discussions of the area and the various communities that dot the wadi. Wadi Amud's path is a part of the Israel Trail, which spans the country from its northern border to the southern most tip. Hikers walk the trail year-round, but the most spectacular time is in the spring, when the flowers are in bloom and the pools are full of water.